Available with or without vehicle or as diy-kit. The UPUAUT II is - in opposite to the UPUAUT I - not a complete vehicle, but a cabin construction, suitable for e.g. TOYOTA Landcruiser BJ, PZJ, HZJ 75, 78 und 79 Pick-Up, Hilux and some other pick-ups of several brands. The UPUAUT II is a very light but sturdy integral construction for the TOYOTA Landcruiser Serie BJ/PZJ/FZJ/HZJ 75/78/79 and pick-ups of some other manufacturers, this monocoque construction is built from high tech compound plastics. 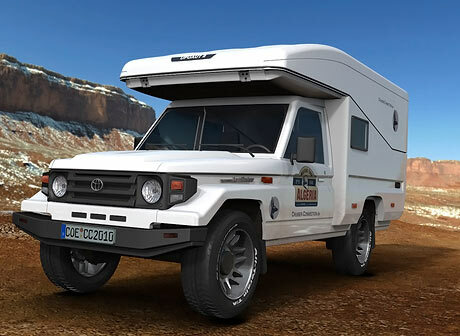 It is the answer to years of questions for an offroad suitable construction and the successor to the complete-vehicle project Upuaut I (Desert Flea) based on the HZJ 73/74. 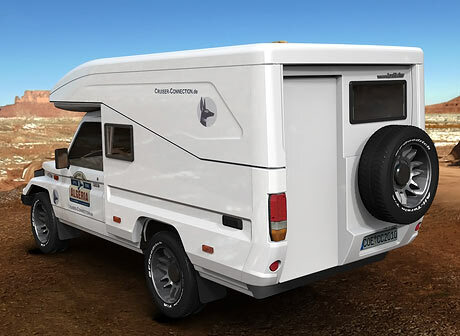 The idea was to construct an exciting alcove accentuated solution that followed the modern design and character of the Toyota Landcruiser BJ/HZJ 75/78/79 without slipping into the dreaded "camper look". 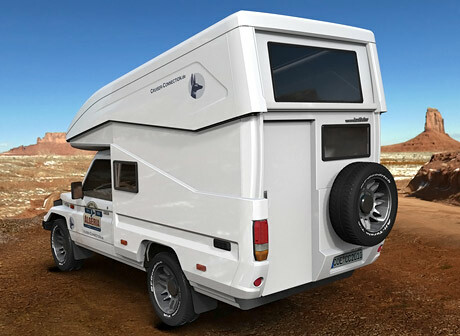 The ingenious pop-up top system with sturdy insulated side walls which even in its closed position with an inside headroom of 1,70 m can be comfortably slept in. Cab and cabin are openly combined with no restrictions. The dimensions for the Upuaut II are not only optimised for the Landcruiser but also for ship containers for easy shipping. Its use under extreme conditions are varied e.g for expeditions, working vehicle, auxilliary and rescue vehicle or as an ambulance. All our goals have been met and the vision becomes day by day reality. The prototype will leave our production at the beginning of 2010 and deployed for hard testing. The Upuaut II mass production is anticipated for summer 2010.